It took only one analytics-related class at Georgia Tech’s Stewart School of Industrial and Systems Engineering (ISyE) for me to realize that I wanted to go into analytics. Like many undergrads, when I entered school I had chosen a general concentration in industrial engineering because I didn’t know exactly what I wanted to do at the time. But after learning about basic modeling techniques and realizing the diverse array of fields I could explore with an analytics-focused degree, I was hooked. Almost a year into my career, I feel fortunate to have graduated from a school that has directly prepared me as well as two of my colleagues who also graduated from Georgia Tech, Abisht Raviprakash and Vinod Cheriyan, to succeed in our careers. 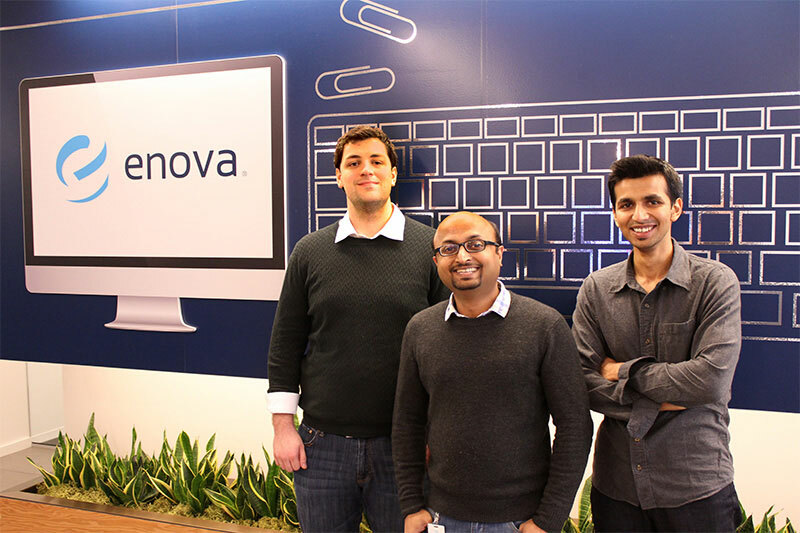 From coursework to extracurriculars, we’ve pinpointed unique knowledge and experiences we’ve gained from our time at ISyE that have set us up for success as we grow our careers at Enova International, a technology and analytics-driven online lender in Chicago. One thing that Georgia Tech does really well is offer a broad range of coursework. Every single industrial engineer takes a fairly wide breadth of classes beyond their concentration. For instance, an introductory course to forecasting and regression gave me the model-building skills I need to write the models that oversee our sophisticated, automated underwriting process at Enova International. A data visualization course gave me the tools I’ve needed to successfully present information to our executives in a way that is both visual and meaningful. Coding was another indispensible skill I learned through coursework and side projects. Having a basic understanding of a programming language – for me, it’s Python – has enabled me to work much more efficiently in my current role. Even something as simple as pulling data into a spreadsheet can save tons of time if I do it myself rather than relying on someone else with specialized knowledge. While textbook learning is invaluable, at some point theory stops and practice begins. Thankfully, through my Senior Design project, I was able to put my knowledge into practice and work on an analytics solution for a large telecommunications company. We were tasked with optimizing their network so that they could fit more data onto the same infrastructure. The project taught me both people skills and technical skills that help me perform my job at Enova today. Most valuable was learning how teams that are working on large-scale technical projects interact with each other. On the Senior Design project, eight of us were working together, so we had to learn how to efficiently decide who would be best at each task based on our individual strengths. We also learned how to interact with executives, both in a formal presentation setting and in sessions for data gathering purposes. The lesson: Much of our success was determined by knowing what to ask, when to ask it, and when to figure it out ourselves. This has translated to my job at Enova, where I’m often working on a multi-department project designed to identify a business opportunity or answer a question such as, “What product should we launch in this state?” It will also come in handy as Enova begins to offer its analytics as a service to external clients through Enova Decisions. Knowing how to successfully contribute to large-scale projects has been essential, and also has enabled me to continue to expand my knowledge by constantly working on new things and learning from others. I get to go deep in the data, but I’m also getting inputs from others and able to watch the entire project lifecycle unfold. When hiring analytics team members, companies look for passionate individuals who have gone the extra mile. The best way to show you’re interested in analytics and a great way to get practice in it is to take on a personal side project. Plus, these can be really fun. For instance, there is a website called Kaggle where businesses post a problem that they want modeled. Anyone can submit a solution, everyone’s answers are ranked, and sometimes there is prize money to be won. It’s a good way to check your progress in a real-world scenario. Georgia Tech does a great job of teaching students how to teach themselves, and this is a critical skill for those going into analytics. It’s a new field that is still changing, and because of this it’s never boring. I was fortunate to find a company that offers a flexible rotation program for new hires that are recent grads, so I was able to try a few different roles at Enova before landing in my current position on the portfolio analytics team. Aside from surrounding myself with colleagues who bring great insights and perspectives and learning from them, I keep up with the latest analytics developments by attending meetup groups, reading online content, and always being on the lookout for new programming languages and techniques to try. Analytics is an exciting and ever-evolving field, and I’m looking forward to continuing to learn and grow as I progress in my career. I’m grateful for the foundation ISyE provided with its challenging coursework and ample real-world opportunities outside of the classroom, and I’d advise any student at Georgia Tech who’s interested in pursuing a career in analytics to take advantage of all the school has to offer. You have world-class opportunities at your fingertips, so make the most of them! Most valuable experience at Georgia Tech: My Ph.D. research gave me familiarity with a wide range of algorithms and a great base in statistics and data analysis – especially with how to deal with imperfect data. What Georgia Tech does best: The coursework is thorough and rigorous, and they teach the “why” behind the “what.” Because of that foundation, I can understand why things work and pick up new concepts quickly. Favorite part of current job: We have a culture of managed autonomy, which means anyone – regardless of level or how recently they joined – can have a huge direct impact if their model is the best. I also love working with really smart people who are willing to help each other. Top tip for current students: Two things: 1) Know the “why” behind the “what” (e.g., why is multicollinearlity considered bad for regression?) and 2) gain experience using real datasets – not just curated samples used in courses. There are many public data sets available that you can play around with to get practical experience. Most valuable experience at Georgia Tech: I had a graduate assistantship focused on building an energy trading visualization map. It gave me exposure to computational skills and programming languages that I use today. What Georgia Tech does best: The coursework is very well structured for an individual looking to go into analytics. Favorite part of current job: I have exposure to a ton of different projects and tools. I’m given a lot of responsibility but also a lot of flexibility in building my own career structure. Top tip for current students: Find something that you’re passionate about and dig into it. Challenge yourself to improve every day.